Horizon Technologies will introduce their Xtender at the Singapore Airshow, which runs from February 6th to 11th, 2018 — the company is a world leader in airborne satellite (SAT) phone monitoring systems for ISR applications, equipping governments worldwide by enhancing their SIGINT capabilities. 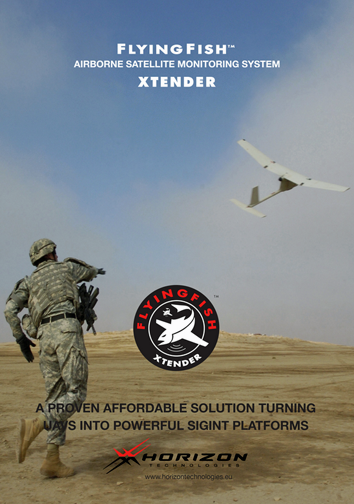 The product — FlyingFish™ Airborne Satellite Phone Monitoring System Xtender — is a proven and affordable solution that turns UAVs into powerful SIGINT platforms. This is a transformational system consisting of Horizon Technologies’ small proprietary Xtender module (<.5 kg.) and unique antennas for unmanned airborne platforms — extending the range of FlyingFish™ for detection of handsets/terminals. Xtender changes the way SIGINT is used on the battlefield, so now units as small as company-sized will he able to get critical data in real time without waiting for a strategic asset. Even the smallest UAVs have full airborne SIGINT capabilities as if the system was on board. Every two years, high-level government and military delegations, as well as senior corporate executives around the world attend the Singapore Airshow to forge partnerships and seal deals in this region. As Asia’s largest Airshow, this is the place to be for leading aerospace companies and budding players eager to make their mark in the international aerospace and defense market! The company will also be highlighting their Xpod for manned aircraft, which turns almost any aircraft into an ISR platform.